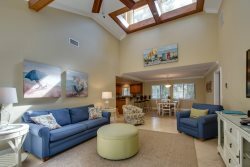 A relaxing getaway awaits you when you book this professionally decorated, chic and modern, four bedrooms, three and a half bathrooms home located in Palmetto Dunes on Hilton Head Island. 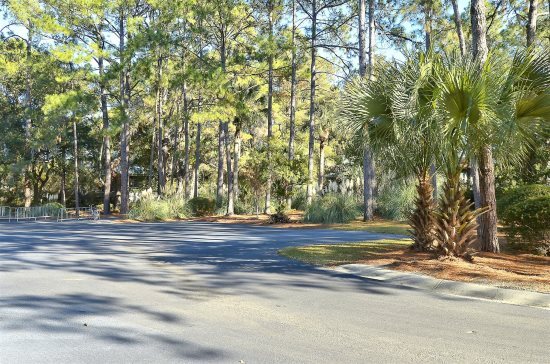 It features breath taking views of the Robert Trent Jones golf course, its own private pool, a screened in porch, and is just a few minutes stroll to the Atlantic Ocean. The four step walkway leads to the inviting foyer with travertine floors and into the adorably elegant and cozy living room. Clothed in tans, browns, and soft blues, this room features a three piece seating group- a sectional sleep sofa and two comfy armchairs, a desk and chair for the determined business person, and a flat screen, 55”, smart, LED television mounted about the decorative fireplace. On the way to the dining room, a door leads to an atrium; the atrium has a table and two chairs and is the perfect place to sit and enjoy a coffee break for two or some alone time with a book. 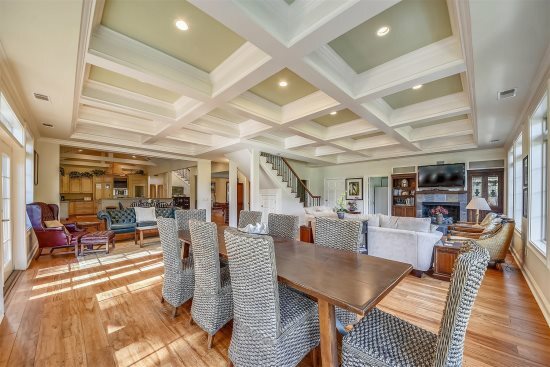 The dining room features a wooded table, eight chairs, and a delightful view of the golf course, that will make your meal that much more enjoyable. Golf course views are also visible from the newly renovated (2018) kitchen. The spacious kitchen has a center island, stainless steel appliances, newly added granite countertops (2018), and a breakfast nook on its outskirts for the family to gather and plan the week’s itinerary or deal a hand of cards. Sliding glass doors lead from the nook and onto the screened in porch, a great place to play board games and entertain friends and family. A washer and dryer are located off the foyer by the powder room. Also located on the main level is the enchanting master bedroom decorated for royals in light blues. It features a new king-size Heavenly bed, a lounge chair with a cushion for back support, a mounted flat screen television, a Jacuzzi tub, and its own private bathroom with two vanity bowls, a walk-in shower, and a chic tub, perfect to lay in after a long day at the beach. There is also a slider glass door from this room to the outdoor wrap around deck; feel free to prop it open at nights and let the stars erase all your troubles. Upstairs you will find the second master bedroom with regal décor, a heavenly king-size bed, a 32” flat screen television, its own private bath with glass shower and pebble floor, and views overlooking the backyard, and golf course. The other two bedrooms have two twin–sized beds, mounted flat 26” flat screened televisions, and landscape views; they share a bathroom. The picturesque backyard with tranquil golf course views is nicely landscaped and provides a great space for reading a book while soaking up the afternoon sun, playing a game of football, or entertaining friends and family. Did we mention that you can rent a kayak and navigate the private lagoon system throughout Palmetto Dunes or ride along the bike paths to explore the Historic Plantation? This home is where the adventure begins and the fun never stops! FREE pool heat available in September, October, April, May with a regular price full week's rental. The sunset team and owners were great. They went out of their way to accommodate us. I really enjoyed the property and hope to visit again soon. Thank you to the owners for providing a great experience. We have been coming to Hilton Head for the past 16 years. Staying @ various villas, eventually buying a time share of our own and for the past 3 years due to the # of family and friends, have rented larger homes on/near the beach. Our stay @ 33 Haul Away was wonderful! The house accommodated our group of family and friends and really provided all we needed in terms of amenities. Although we prefer to be right on the beach, this property was in walking distance and we would definitely rent this home again. Well cared for and lovely! Extremely friendly and engaging, were able to answer any questions we had very quickly. Highly recommend Sunset Rentals. Lovely property, lovely people. Stay with them!